As 2004 ends, with pride I must say it was a great year for me, yet with even more pride, it was a great year for North Carolina Croquet. For those of us fortunate enough to live in North Carolina, we can think of many reasons for our successes. The North Carolina District provides numerous Development Clinics to assist in skill building in both Association and American Rules. Our District has an enthusiastic group of leaders that are never satisfied with the status quo, but are always looking for new ways to enhance player participation and skills. The North Carolina Calendar is full of more tournaments and activities (American and Association) than probably any other state. For any state or district to be successful there must be a hub that acts as a catalyst for croquet activities. We have that catalyst in the Pinehurst Croquet Club and the Pinehurst Resort. Pinehurst has spawned activities in clubs throughout the state. 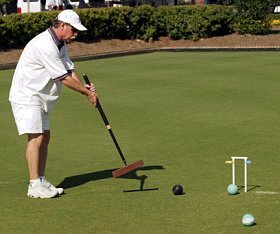 There are many times the members of the Pinehurst Croquet Club have given up the use of their lawns for the good of North Carolina croquet development and tournaments. Western NC clubs—especially Etowah, Linville Ridge, Grandfather Mountain, and Eseeola—have also been very generous with their lawns. These club members need to be assured their sacrifices and generosities are truly appreciated by local, national, and international players. The spirit of giving and cooperation by the clubs has come from a tradition that is and has been promoted by Mack Penwell for many, many years in our state. The drive, dedication, and coaching that Mack has provided has not only helped “grow” clubs that are cooperative in the NC District, but also has instilled a sense of good sportsmanship and fair play through out the state. The rewards I have reaped this year: 2004 USCA International Rules National Champion, Winner of the USCA Grand Prix, and Association Laws Player of the Year in the ACNA contest, would not have happened without being involved in North Carolina Croquet. Thank you, North Carolina. Thank you, Pinehurst Croquet Club. Thank you, Mack Penwell.